Iceland's Urgent Bid to Join the E.U. 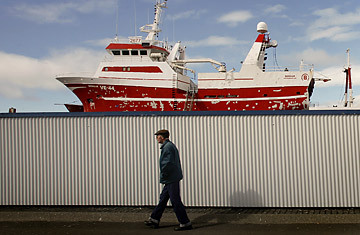 A man walks past a fishing ship being repaired in a dry dock in Reykjavik, Iceland, which has begun talks to join the EU. The people of Iceland are known for their resilient, go-it-alone character. It is the result of a forbidding geography: endowed with a rugged terrain pockmarked by geysers and volcanoes, their island stretches into the Arctic Circle, and is nearly 620 miles (1,000 km) from mainland Europe. But these days Icelanders are enduring an identity crisis. Almost bankrupted by the economic downturn  which they call the "Kreppa"  they are shedding age-old shibboleths about their sturdy self-sufficiency. On Thursday, they did what would have been unthinkable just one year ago: they reached out to the European Union for help. In a narrow 33-28 vote, the Althingi  the world's oldest parliament  backed formal accession talks with the 27-member E.U. "This is probably the most historic vote in the history of our parliament," Prime Minister Johanna Sigurdardottir said after the vote. Sigurdardottir, an openly gay former air stewardess, says E.U. membership is the only viable option to anchor Iceland's shattered economy. "I sincerely hope and believe that we will end up with an agreement that will help us create the necessary economic stability, [and] ensure prosperity in the long term for both families and businesses," she added. It's a big wish for the tiny nation of just 320,000 people. But last fall's abrupt economic collapse forced Iceland to rethink its traditional skepticism about the E.U. In the space of just days, as huge debts tore at Iceland's banking system, the country went from being one of the world's richest nations per head to virtually a failed economy. The statistics tell a stunning story: Iceland's currency, the krona, shed nearly half its value; inflation rose to over 12%; the stock exchange fell 89%; a $10 billion IMF bailout was sought; half the country's businesses became technically insolvent; 15% of Icelanders fell into negative equity. Now Iceland sees the E.U. as a safe haven from the world's harsh economic winds. In particular, euro membership would allow it to ditch the crippled krona. The E.U. would gain a new member with similar values to its own, which would help strengthen its reach as a global power. In return, Iceland can expect accession talks to move at a double-quick pace. As a member of the European Economic Area (EEA), Iceland already has access to the E.U. 's single market. It is also part of Europe's border-free Schengen zone, and virtually all the other E.U. programs open to non-member states. Around two-thirds of all Icelandic law is already in line with E.U. rules. Even the touchy subject of fishing rights could be overcome. Iceland has long jealously guarded the sovereignty of the lucrative, 200-mile (320-km) fishing zone around the island. Fish and seafood account for 37% of Iceland's exports, and employ 8% of the work force; even ardent Euro-enthusiasts are loath to see their prime natural resource fall under the sway of the E.U. 's controversial Common Fisheries Policy (CFP). But while Reykjavik cannot expect an exemption, it could negotiate special protocols to take account of the importance of the fishing sector to the nation. All this means that Iceland could leapfrog other wannabe members in the E.U. queue such as Albania and Turkey, and join at the same time as the current frontrunner candidate country, Croatia. E.U. enlargement commissioner Olli Rehn told U.K. daily The Guardian in January that it could happen as soon as 2011, although most other scenarios put it at 2012 or 2013. "The E.U. prefers two countries joining at the same time rather than individually," Rehn said. "If Iceland applies shortly and the negotiations are rapid, Croatia and Iceland could join the E.U. in parallel." Joining the euro could happen soon after that. Reykjavik officials have backed down from their earlier talk about "unilateral euroization"  using the single currency without going through the rigorous euro accession process  but once the economy settles, joining could be relatively straight-forward. Iceland's debt, deficit and inflation rates currently too high to fulfill the euro criteria  are expected to fall fast over the next few years to meet the entry demands. However, the government would almost certainly need to renegotiate its $6.3 billion agreement to reimburse the Dutch and British who had accounts with Icesave, the internet arm of the now-defunct Landsbanki, which collapsed last October. The deal was a condition of the IMF bailout, and Iceland has 15 years to pay it back. But the sums total almost half the country's annual output and could jeopardize any recovery. Nevertheless, now that the parliament has backed the E.U. bid, Iceland's application is expected before the end of July. The European Commission could rush through an official positive opinion in six months, which would make Iceland a formal candidate by early 2010. The actual entry talks could take another year, or two. At the same time, Iceland would have to amend its constitution. The final say would rest with Icelandic voters, who will eventually decide on accession in a national referendum. Although opinion polls currently show around 70% of Icelanders backing the launch of E.U. accession talks, there is still time for voters to change their minds about joining. But whatever the outcome, Iceland has already destroyed its myth of splendid isolation.